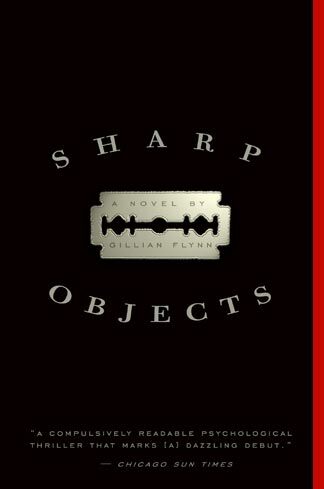 Sharp Objects by Gillian Flynn – CRITICULT – Telling you what to think since 2003. Sharp Objects is a mystery/thriller told from the perspective of a narrator that is not unreliable so much as untethered. This is a dark and at times brutal book that offers little light and hope and puts the reader in the shoes of a character who starts off broken and proceeds to shatter as the story progresses. Working as a reporter in Chicago, 30 year old Camille Preaker is called in to her editor’s office one day and briefed on a missing child case in her home town of Wind Gap, Missouri. Six months earlier another girl had gone missing only to have turned up dead. Her editor thinks it could be the work of a serial killer and wants to break the story first. So against her better judgement Camille returns to the home – and family – she fled years before. When the missing girl is found dead, suffering injuries same as the girl murdered 6 months before, the town is thrown in to a panic and Camille begins to suspect she knows the killer. This realization forces Camille, already fragile and raw after a recent stay in a psychiatric hospital, to confront the mother she can never please, the half sister she never knew, and the roots of her dark inclinations toward self destruction. The set up for Sharp Objects isn’t unique. The mystery/thriller genre is full of cops, reporters, shrinks, etc., that work to solve that one case which conveniently ties in to their own back ground. By the half way point most readers are going to be convinced they know not only who did it but why. Rather than relief the book becomes unbearably tense as you wait for Camille to realize what is going on even while hoping you are wrong. Camille is a well realized protagonist because even as she makes incredibly poor decisions and edges closer to the edge the reader can still understand why she is so unstable. There are points in Sharp Objects where you want to slap Camille but she always remains sympathetic. Even with a last act twist the story remains grounded in the plausible which makes the events all the more gruesome. Sharp Objects is much closer to horror than thriller as the events and motive are truly gruesome and hard to fathom. While not a graphically violent book, the psychological trauma inflicted is truly horrific and gives the novel a tone of helplessness that perfectly fits with Camille’s spiraling breakdown. Gillian Flynn’s writing is precise and direct. She has an uncanny knack for capturing the emotion and essence of a scene without going overboard with descriptive phrases. More than anything else, Flynn puts the reader in Camille’s head space forcing you to accompany her on the journey whether you want to continue or not. My paperback copy includes a quote from the Chicago Tribune: “Keeps you reading with the force of a pure but nasty addiction.” That sums it up perfectly. As much as you may want to close the book you are compelled to keep reading until the conclusion even as your stomach is churning. For those willing to take the journey Sharp Objects is a compelling and gripping story that takes the familiar and turns it in to something altogether darker. While technically a mystery, Sharp Objects is not an airport read. Fans of dark fiction with mature subject matter should absolutely not pass it up.